Streetglo's Motorcycle Safety Website, all about safety. · You can make a difference! Motorcycle and Bike Safety is something that some of us think about, some of us worry about, but many of us do too little or nothing about it! For many of us, it seems that protective clothing is too restrictive, or is much too hot in the summer heat. Just look at your average rider rolling down the boulevard all cool, collected and casual. Tank tops and brain buckets are the norm with this group. I've been there, done that, how about you? And don't forget the sport bike missile rider that launches past you in the hammer lane at 100+ mpg! I haven't done this one, but what about you? These are two of many types of riders that riding in denial. It is these two types of riders that are contributing to the increasing death rate for motorcycle riders here in the USA and worldwide. While we are contributors to our own accidents, injury and death rates, we are also victims of other motorists at an alarmingly frequent rate! One of the greatest causes of death or injury, and the leading mortality factor for bikers, is not being seen by nearby motorist. Many of us have died simply because another motorist didn’t see us. It’s not that people in cars can’t see us, they just don’t see us. Motorist get into the habit of driving “in zone” and not necessarily in a full awareness mode. We are all guilty of it. Driving becomes so second nature that it’s almost a reflex rather than an activity. As motorcar drivers, it becomes especially easy to drop into the zone while we sing along with our favorite CD, play with the cell phone, or dine on burgers and fries while engaging the highway or interstate. While in the zone, we tend to see mostly obvious objects such as big cars, tractor trailers and other attention grabbing objects. These big objects break through the “zone” and motorist respond accordingly by stopping, slowing down, or clearly signaling an intended turn. However, pity to those that can’t break thru this zone (you and I and the other millions of motorcycle riders) If you don’t believe about motorist driving in the “zone”, just think about it…. Do you know anyone that had an accident when they were truly making an effort to drive cautiously? Probably not, at least not in the snow or during a terrible storm. This zone can be a very cozy place for most motorist, but it’s a deadly zone for you and I. Our bikes just aren’t big enough or loud enough to break through the zone. I can honestly say that all my accidents and even all my speeding tickets in my car, over the last 35 years, have happened when in my zone. Even the times someone else hit me, I probably could have avoided or minimized the vehicle to vehicle contact had I not been in the zone. The zone is the deadliest thing you will face as a motorcycle rider! Pay attention to this article because it can help keep you out of the zone! As a motorcyclist, if you want to avoid being injured or killed by another motorist, stay out of their zone! The best way to stay out of the zone is to ride defensively, assume every driver is in the zone, and most of all, call a lot of attention to you, your bike, and your presence. A huge Mack truck does a pretty good job of staying out of the zone. Most motorist will absolutely see a Mack truck. Your itsy bitsy tiny motorcycle is another story completely. It very comfortably hides in it’s own open lane and that’s a fact! Your bike calls very little attention to itself and if you believe otherwise, you are in the zone right now! Often, a motorist appears to look right at you and still may pull out in front of you. We bikers need a much bigger zone presence and anything you do to increase your zone presence can save your life! Thankfully, there are a few inexpensive things you can do to increase your Zone presence and some of them only require a few minutes of your time. First, do you ride in daylight with your high-beam on? Is your high beam properly adjusted for maximum legal beam height? Many bikers are riding in daylight with the low beam. That’s a BIG NO-NO! Furthermore, many bikes have a misadjusted headlamp pointing way to deeply into the asphalt. Next time you see an approaching biker group, pay close attention to the pack. After you get over the fact you’re not riding with them, look at the pack and pick out the bikes that command attention to their zone. They are the few, believe me! You should be able to pick out the high visibility bikes immediately from the rest of the pack. Which bike is yours? I hope you are in the high visibility group. Well lit bikes simply have a great street presence and headlamps can be your greatest defense against an opposing left turn in front of your bike. I have no proof to share, but I honestly believe brightly lit bikes are hit less often than dimly lit ones. Some bikes are very noticeable while others can easily disappear into the Zone. Which bike do you have? If you have a properly aligned headlamp (high beam always on in daylight) and properly aligned running lights, you can easily increase your zone presence to that of a much larger vehicle. It's hard to left turn in front of a biker when his headlamps are blasting bright rays into the windshield of the left turning car. Take immediate action now and adjust your headlights, and use them always on high beam and running lights on during the day. It can greatly improve your chance of not getting hit! If you are worried that your bright light and running lights are too bright in the daylight as to blind a motorist, don't worry! Unless you are running some kind of super nuclear bulb, you will never outshine the daylight. For all that believe "loud pipes save lives", I say to you that "loud lights save more lives"“! When you combine a brightly lit high beam head lamp and two properly positioned running lights, your zone has suddenly become visually loud — a great advantage to you. This is the perfect scenario to break thru the zone and get the attention of the motorist. Simply put... Maximize your frontal zone appearance and you decrease chances of suffering the number 1 cause of mortality in our brotherhood, a left turn from an opposing car in front of you. Now that we’ve covered the front, I have bad news…. The back of your bike is a problem too. Being rear-ended is a "not fun" activity. If you have a tiny, measly and anemic brake light, as do many stylish models, replace it immediately or consider one of the Halogen brake light bulbs from J.C. Whitney ( http://www.jcwhitney.com ) for about $10.00. These halogen brake lights are about 35% brighter and can add a little visual noise to the rear of your bike and help call attention to your brake when applied. Also consider installing rear running lights that also supplement your brake light. Three bright lights on the back of your bike are much safer than a single anemic brake light. It only takes minor changes to generate a huge safety payback. Correct bike lighting on the front and rear of your bike can greatly decrease your chance of being hit. And while on the subject of lighting, consider adding side lights as well. Side lights are much more effective in night riding. At night, they can help avoid being taken out on your left or right side when approaching an intersection. There are an assortment of extremely bright LED illuminators that can be mounted under your fuel tank and cast a warm light glow on the asphalt below. These super bright LED lights can create quite a large lighted space on the roadway and can be seen for several hundred feet away. Check with your state law to determine legal colors and requirements first, but if legal, add them! Now we’re all lit up, what else can we do? Reflective Decals and Bright Motorcycle graphics are a good step! For nighttime riding, I strongly recommend reflective materials both on your body and on your bike. A well illuminated bike is going to bring attention to a motorist that is within striking zone, especially if you ride with multi-color reflective items. My favorite configuration is a large and bold reflective helmet decal kit, a reflective vest or jacket, and you can even buy an assortment of reflective motorcycle graphic kits such as tank flame graphics or fender graphics. I suggest that you investigate reflective products and pay close attention to items that can be permanently attached to your helmet or motorcycle. My favorite place for reflective motorcycle graphics and helmet decals is Streetglo Reflective Decals and graphics ( http://www.streetglo.net ). They have a very impressive photo at this site that demonstrates the effectiveness of reflective helmet decals and reflective motorcycle graphic kits. 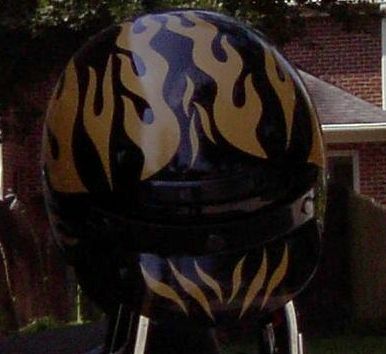 On my own bike, I have a large racing stripe reflective decal configuration on my helmet that is visible from the left, right and rear of the helmet. On my motorcycle itself, I have at least 144 square inches of highly reflective graphics in the form of decorative reflective pinstripe and reflective gas tank flames and reflective fender flames. These reflective flame decals look absolutely stunning in the day and dress up the bike at night. Best of all, they explode in bight colored light at night whenever headlights are pointed at them. You can see the side of my bike better from the reflective decals than the headlamp itself (side view). With the right combination of reflective decals, permanently installed, you are still pretty well protected even when you forget to bring along a reflective vest or jacket. Reflective decals and materials are especially important if you have a dark colored bike. If you are not willing to consider reflective decals on your bike, consider airbrushing with contrasting bright colors on your fenders and tank. There are a number of really nice airbrush sites on the internet that can give you ideas for your own bike. Visit http://www.streetglo.net/links as there is a large collection of airbrushing sites in Streetglo’s motorcycle index. The point that should be taken here is dark colors don’t reflect light very well. If you want to ride safe, you must take all available actions to make sure your bike is seen, especially at a 90 degree angle when riding at night. While airbrushing can be very expensive it can add great visual impact to your ride not to mention some designs can make an ordinary bike an extraordinary one! If something less expensive is on the agenda consider reflective decals and vinyl graphics which are relatively inexpensive. If you go the route of vinyl graphics, then select Reflective Vinyl over any other type. There are several companies that specialize in reflective vinyl graphics including Streetglo, Reflective Decals and others, just to name a few. You can completely customize your bike with reflective graphics for less than $100.00 including really bright reflective helmet decal designs. Having your head illuminate like an alien spaceship when a car is within striking distance of you is a pretty cool idea! To maximize your appearance at night with reflective graphics I suggest a combination of items including large and bold reflective helmet decals, reflective pinstripe and reflective motorcycle graphics. You can find really attractive tank flame graphics or other tank graphics to suite your taste. Combine them with attractive fender graphics for a totally illuminating experience! If you are a sport biker rider with factory graphics, consider overlaying reflective graphic designs to make a multi-color graphic. There are some ready to install kits… or you can order a custom kit from nearly all reflective decal manufactures and still not spend more than about $100.00 or even much less! If you aren’t much into decorating your bike, consider same color reflective decals and reflective tape. While this will do little in the daytime, it can save your life at night. Same color reflective tape sells for about $5.00 a roll and it won't change the appearance of your bike. There is no single thing you can do to make your motorcycle ride safer. You are required to take many steps. Being seen and driving defensively are probably the two areas that can greatly reduce your chance of being hit. There are many other things you can do to improve your chances of surviving your next motorcycle ride. First, realize your own mortality is in your hands every time you mount your bike and pull out of your driveway. Realize that your greatest threat is not being seen followed by your own ignorance of not anticipating turns and bends in the road. If you find yourself entering a turn too fast understand that experience may be the difference between completing the turn or rocketing over the shoulder or into oncoming traffic. If you haven’t taken a safety course, take one now. Safety courses aren’t just for the beginner. Personally, I prefer to ride in light traffic situations. I’m not an interstate rider and I don’t enjoy 70 mpg cruising. My point is ride your comfort level and don’t go beyond your comfort level. If you stay in your comfort zone, you are more likely to avoid an accident and you’ll enjoy your ride much more. And don’t forget to check your lighting and make the necessary adjustments. Take action now on your bike to make it naturally safer with visual effects. It can keep you out of the Zone and this is a good thing! Reflective Helmet Decals, Reflective Motorcycle Graphics, Reflective Tape, Reflective Helmet Stickers, Reflective Decals and Reflective Motorcycle Pin Stripe. A lot of accessories including dozens of additional lighting options for your bike. A very large listing of motorcycle sites including safety sites, accessories, and safety courses. The contents of this article are not the views or opinions of Cobra International t/a Streetglo Reflective Decals and Graphics. This article is not an endorsement of the information therein. We have no affiliation with this writer and are not responsible for the contents thereof. We are looking for Authors that wish to feature their informative articles free. Please EMAIL us for details and we’ll get back to you.